Adam West 1928-2017 « Midlife Crisis Crossover! My relationship to the incomparable Adam West mirrored much of my Gen-X comics-collecting peers. As a kid, Batman ’66 reruns were among my first exposure to super-heroes, and quite probably a chief contributor to my first lessons about the differences between right and wrong, between good and evil, and between gentlemanly manners and hotheaded teenagers. Sometimes I laughed, but more often than not, West’s version of the Caped Crusader told me this is what super-heroing was all about — truth, justice, keeping calm, creative problem-solving, and civility toward others, even those you’re arresting. I’d been reading comics since at least age 6, and the series’ hokey patter wasn’t that much of a stretch from average Marvel and DC fare of the day. My favorite Batman, as rendered by the dynamic Jim Aparo (likewise RIP), was grimmer and smiled less than Adam West, but I had no problem reconciling the two as valid interpretations, except I didn’t put it in those terms. I liked this Batman and that Batman. As a teen, Batman ’66 was the WORST. Age 14 was the all-new, all-daring, “comics aren’t just for kids anymore!” era of Watchmen, Art Spiegelman’s Maus, and Frank Miller’s Dark Knight Returns, in which an elderly, unsmiling Bruce Wayne had aged into a bitter, rueful, uncompromising piledriver of a vigilante thanks to horrible events and choices in his life. As a junior high outcast who yearned to be taken seriously, I gravitated toward these dark new worlds where no one and nothing were laughing matters. Adam West’s shining role model and his silly sound effects were the exact opposite of what I now valued and were therefore reclassified Uncool. Batman reruns and the fans who loved them were ruining comics! Yeah, I had some sound effects for them: BOO! HISS! BLECH! EXPLETIVE! As an adult, I wish I could slap my teen self around a bit. I wish this rather often, not just when reflecting on Batman. The misbegotten offspring that followed Maus, Watchmen, and Dark Knight and reveled in pessimism or nihilism (thereby missing the point of any of those three) are no longer my thing. Those heroic old-school values are cool to me again. I’m in a better position to appreciate Adam West’s deceptively straight-faced performance and the multiple levels on which it works. And I no longer care about the opinions of anyone who thinks Batman reruns and the fans who love them today are bad for comics or for grim-‘n’-gritty films. In a roundabout way, my life as an Adam West fan hasn’t been too far removed from the standard father/son life cycle: revered him as a kid; rejected him as a too-cool teen; eventually realized why he was right all along after I grew up. 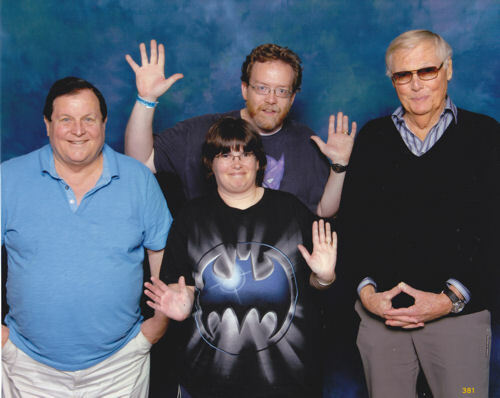 I’m sorrowful tonight but glad I had the chance to meet Adam West and Burt Ward once back in 2014 at a convention here in Indianapolis. Anne had already had the pleasure of getting his autograph and exchanging kind words with him at a previous Wizard World Chicago (I’d been in other lines and missed that opportunity because sometimes I’m dense), but she didn’t get a photo with him. So we figured this hometown show would be a great chance for both of us to say hi, get a photo op, and, better yet, see if they’d do jazz hands with us. Longtime MCC readers are well aware this is our thing, and 2014 was the year we launched this ongoing permutation in our fandom expression. 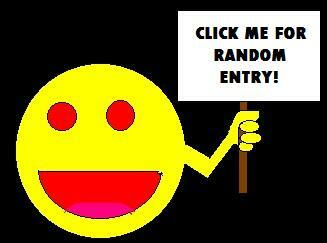 The line was late in the day, rather long, and ushered along rapidly once it began. As we reached the booth, we could tell Batman and Robin were mostly hanging out motionlessly while fans posed around them. Not a problem for us — we realize older actors aren’t as mobile or excitable as they used to be and can’t exactly do acrobatics on cue in their advanced years. We figured we’d let them have their dignity while we filled in the margins around them with jazz hands and goofiness. We proceeded to exactly that, standing to either side and doing our thing. Adam West side-eyed us, realized what we were doing, and chuckled. The photographer snapped our photo, we were ushered out, and history was made in a way that no bitter young fan-dudes could ever take away from us. We had made Adam West laugh. More than the cost of the photo op, that split-second moment of off-kilter entertainment was the closest I ever got to repaying him in kind for what he’d done and meant for me and countless others, even during those phases when we were all too stubborn and “cool” to acknowledge it. May he rest in peace, secure in the knowledge that his legacy lives on, and treated in Heaven to sound effects so amazingly transcendentally empowering that we just can’t even imagine.